FIV positive cats can live long, healthy and relatively normal lives with no symptoms at all, yet there is so much misinformation circling about this disease that some veterinarians still recommend euthanizing cats who test positive. A new study in The Veterinary Journal written by Annette L. Litster of Purdue University’s College of Veterinary Medicine’s Department of Veterinary Clinical Sciences presents Lister’s conclusions about FIV positive and negative cats living together based on research of the cohabitation of cats living in separate rescues. In the one rescue, Litster discovered that FIV was not passed between infected and non-infected cats during normal day to day interaction in a shared living environment. In the second rescue, Lister’s studies also showed that FIV was not transmitted to kittens when their mothers were already infected prior to birth. FIV, or Feline Immunodeficiency Virus, is a cat-only disease which cannot be transferred to humans or other animals. It is a slow virus that affects the cat’s immune system over a period of years. The infected cat can fight off the infection and become totally immune, can become a carrier that never gets sick, or worst, end up with a compromised immune system. FIV is not easily passed between cats as it cannot be spread casually through litter boxes, food and water bowls, or snuggling and playing. This disease is transferred when an infected cat bites another cat and breaks the other cat’s skin. This means that a neutered cat in a home is highly unlikely to infect any other cats as long as they are properly introduced or are not particularly aggressive in nature. FIV is much more difficultly transmitted than people are led to believe, and there is often confusion between FIV and FeLV. Litster’s studies document FIV positive and negative cats living together harmoniously without the disease being transmitted among the group members, despite sharing all the same bowls, litter boxes, bedding and engaging in mutual grooming and even episodes of mild aggression. These studies coupled with the further understanding of exactly how FIV is spread demonstrates why it is not valid to assume that FIV positive cats can’t live together with their fellow uninfected feline friends. The vast majority of cats, once neutered, have no desire to bite the other cats they live with. They may play fight, but this rarely leads to a serious bite which is what would be required to inject the virus. 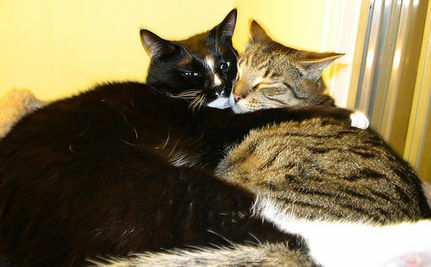 Read stories from real cat owners sharing their experiences of cohabiting households here. FIV is shrouded in rumor and prejudice, and as a result too many cats are deemed unadoptable and end up being euthanized. These groundbreaking studies by Litster provide evidence that FIV positive kitties are not the great danger to their brethren as we may have once thought them to be. Hopefully this new research can help veterinarians and shelter staff to advise cat owners and adopters to make better informed decisions and in turn help put an end to FIV positive cats being needlessly killed due to a completely controllable and non threatening illness. Check out FOHA for more information about FIV positive cats and FIV negative cats living together in peace. I have 6 FeLV/FIV+ cats all living happily and healthily together. This is really good news!! Now, they just need to inform all the veterinarians of it so they will stop recommending euthanasia!! Yes! In the veterinary field, we've known this for years but it needs to be more widely known. Thanks for posting.